1990's, 36 bust, calf length, full pelted, dark brown ranch mink coat. 1990's, 36" bust, calf length, full pelted, dark brown ranch mink coat. 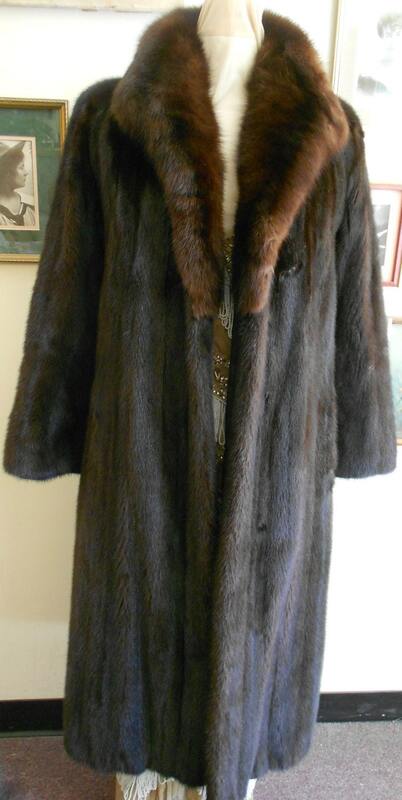 1990's, 36" bust, calf length, full pelted, dark brown ranch mink coat. The coat is slightly indented at waist, with long straight sleeve and no cuffs. Collar and lapels are deep and are a slightly lighter brown color. Slit pockets are at each hip, and are lined in black velour. Coat is fastened in front with three strong hooks and eyes, placed under color and waist and hips. Label reads "John Tanben" Houston.